When choosing a school for your child, you are also choosing a community for your family. A Children's Habitat has always been sought after for the close-knit community that forms here and, as such, has become one of the school's greatest assets. In addition, research clearly shows that one of the most constant predictors of a student's educational success is the active interest and participation of the parents in their schooling. 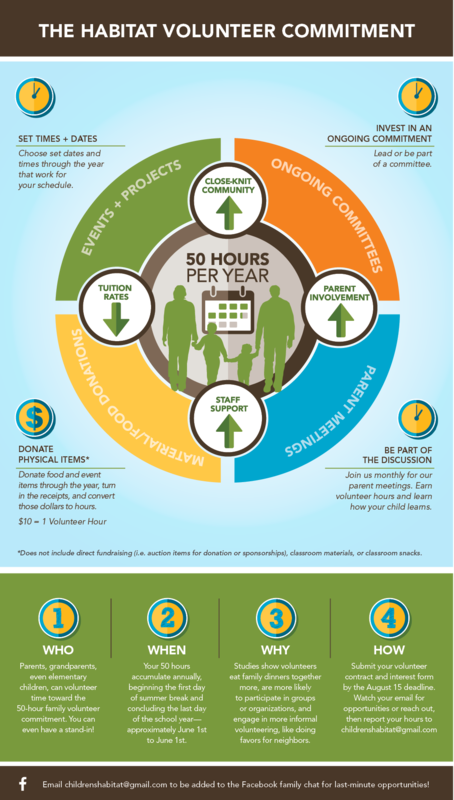 It is for these reasons that A Children’s Habitat requires a volunteer commitment from every enrolled family. Throughout the school year, parents and families have opportunities to show their support in many meaningful ways: by volunteering time and services to support school events and special projects, by serving as leaders on the Board of Directors or on committees, through financial contributions, and by actively participating in their child's education. Each family must give an average of four to six (4-6) hours of their time to Habitat each month, or a total of 50 hours annually. In addition to volunteer hours, parents are required to attend one (1) parent meeting per semester for a total of two (2) parent meetings annually, though of course, we hope you will feel encouraged to attend more. Volunteer hours and parent meeting attendance are tracked and recorded on an ongoing basis by our administration and reported throughout the year. All families must have a volunteer contract on file with the office at all times. Families unable to complete volunteer hours will be assessed a fee of $10.00 per hour at the close for the school year, or a maximum of $500.00 annually.